For Some Students, Getting An Education Means Crossing The Border There are hundreds of kids who are U.S. citizens but live in Mexico. Every day they walk across the border to go to school in California. 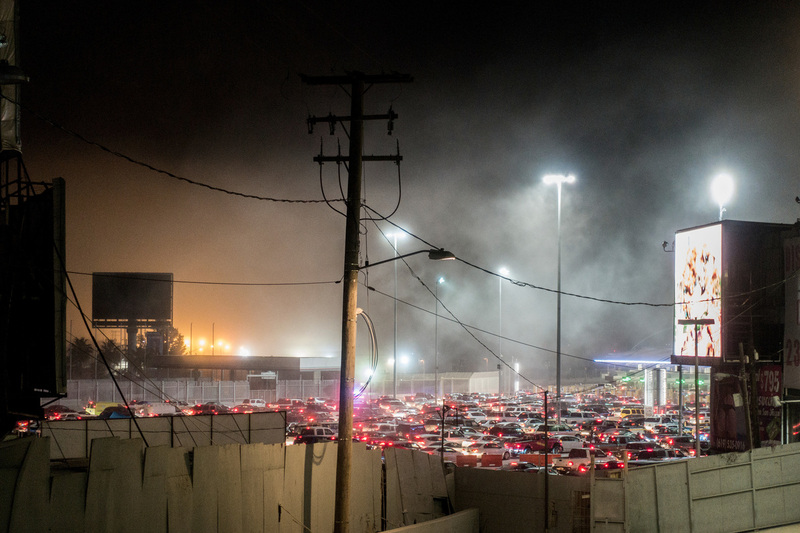 Cars wait in line to cross from Mexico into the United States on May 2 in Tijuana, Mexico. The U.S. government says approximately 50,000 vehicles cross between Tijuana and San Diego every day. The land border crossing between Tijuana, Mexico and San Ysidro, Calif. is one of the busiest in the world. Every day 25,000 people cross the border on foot. Among the crowd are students whose families live in Tijuana. Each morning their families commute many hours to bring the children to school in the U.S.
Juan and his mom, Maria, wake up at 5:30 a.m. each day to make the trek from their home in Tijuana to Juan's high school in San Ysidro. Some mornings, crossing the border can take up to an hour and half. "It's been kind of, it's been a lot," Juan says. "Every day crossing it's like, the time management, it's finishing homework on time. It's a lot." But Juan's mom says it's worth the sacrifice. "He has more of a future here in the United States," Maria says. "The school is much better here than in Tijuana. It's a lot of work. A lot for him and for me. We wake up very early, wait in line, but it's worth it." Juan and Maria asked not to be identified by their last name because families caught living outside the district can be fined the cost of their education. Teachers in San Ysidro say as many as 1,000 students cross the border every morning to go to school. 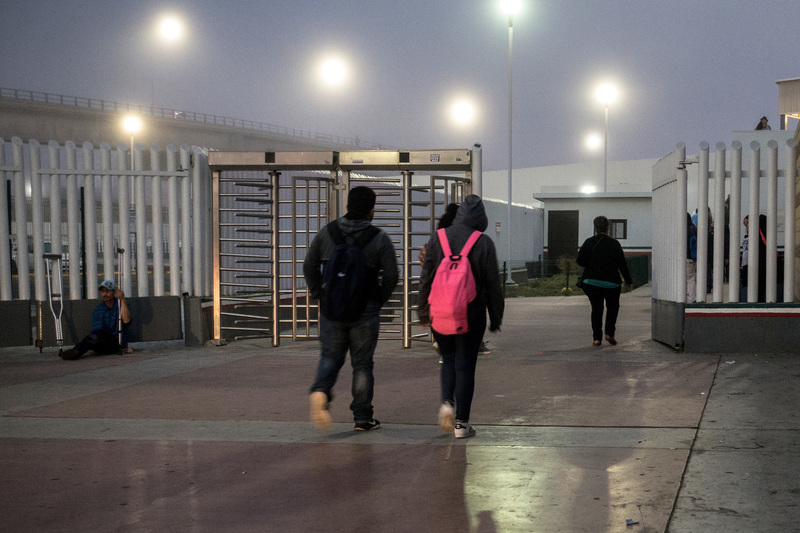 Students in Tijuana walk toward the U.S. border early in the morning on May 2. Teachers in San Diego estimate that about 1,000 students cross from Tijuana into San Diego every day to go to school. By 5:30 a.m. on a typical day at the border crossing, a steady stream of cars continues to pull up to the Mexico side of the border and drop off kids. They all make their way through the fence and up the ramp to cross the border into the U.S. to go to school. The kids are of all ages. High school students come in groups of three, four and five, and younger kids walk with their parents. On the other side of the border, some students get on the bus, and others take off on skateboards and bikes. Many of the younger children will walk just a few blocks to Willow Elementary School where Nancy Alvarado has taught 5th grade since 2000. "In many cases, those are the kids who are here every day with their little backpacks on, their hair done, their breakfast eaten, and they get up at the crack of dawn," Alvarado says. "Any parent who makes that sacrifice obviously wants their children in school." Alvarado says there are two primary reasons families move to Tijuana. One is the cost of living in southern California. The San Ysidro School District has a staggering 33 percent student homelessness rate, the highest in the country. In other cases, if parents of kids who are U.S. citizens find themselves forcibly removed from the U.S., many parents still want their children to have a U.S. education. "We have kids arrive mid-year because someone got deported, and that's every year," Alvarado says. "We have kids who arrive in, like, April." She says they ask the students questions like, " 'Where were you before? Bakersfield. And what brings you here? Ah, my dad was deported.' That's every year." All but one of Alvarado's 30 students are Hispanic and many commute from Mexico. She says she can see that her students are visibly stressed by having to cross the border every day, especially now with the heightened rhetoric about illegal immigration. "They hear the rhetoric of 'build the wall' and imagine the Berlin Wall," Alvarado says. "My kids are very aware of it." Public school budgets are determined by attendance and funded through property taxes. In order to enroll, families must prove residency. No one from the school district responded to a request for comment on whether families or kids traveling daily from Tijuana were skirting the rules. But Jason Wells, the executive director of the San Ysidro Chamber of Commerce says the community has faith in its system. "As a community we trust in our school district and what they do as far as their handling of residency confirmation," Wells says. "I wouldn't say that the community sees children coming from Mexico as a tax burden. This community is very supportive of people regardless of their immigration status." When Maria registered Juan for school last year, the two still lived in the district. "We lived here in San Diego, but here the rent is very expensive," she says. "So, I decided to go to Tijuana." But before next school year, they will have to find another way to prove residency. "I'm scared. Next year, they'll ask for a lot of papers," Maria says. "I'll ask for an address from one of my family members. I'll ask for a favor and maybe he'll stay here with them. It will be harder for me because we're used to being together, but, well, he has to." Alvarado is quick to point out that most of the families who cross the border would likely be homeless if they stayed in San Ysidro, and wouldn't be paying property taxes anyway. "Those kids are American citizens," she says. "They have a right to live here. That they don't live here now doesn't mean they won't live here someday." With that being the case, she says it's in the community's and the country's best interest to see that these students get an education.